Later this month, Telltale Games—makers of Sam & Max and Penny Arcade video games—will release a new poker title featuring, among others, Team Fortress 2's Heavy. That's not the only incentive luring TF2 fans to do some gambling. To help promote Telltale's Poker Night at the Inventory, Valve is adding a few more items to the increasingly long list of equippable Team Fortress 2 goodies, including a new wristwatch for the Spy (The Enthusiast's Timepiece), Strong Bad's "styling" glasses (for the Demoman) and something known as the Lugermorph for the Scout and Engineer. 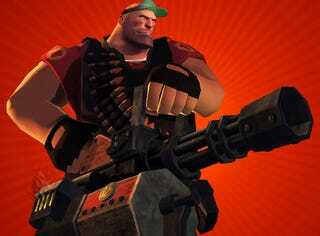 Of course, there's also a new visor and the Iron Curtain, a new mini-gun, for the Heavy. All are available to owners of Poker Night at the Inventory as unlockable items, but only the visor will be available to those who pre-order. "Poker Night at the Inventory includes special rounds periodically where characters will buy in with un-lockable Team Fortress 2 items," Telltale explains. "If the player wins the round, the item becomes theirs to use in TF2." Considering the price of some of those Mann Co. items in Team Fortress 2, five bucks now looks like a steal. You win, Valve. Update: Telltale provided images of all the unlockables. We've also corrected the specifics surrounding the availability of items in Poker Night.